Great project, but that soldering makes me cringe. In the past, crimp contacts for PCB connectors, and the matching crimping tools were very expensive, so I also often soldered wires to those connectors, but nowadays they’re so cheap, that there’s no excuse to not crimp your own cables. At the very least he could have desoldered the pin headers and just solder the wires through the holes. I don’t think JD was trying to convey fear… Revulsion at the soldering in the video, perhaps…. > being up typing at the keyboard when I should have been sleeping. 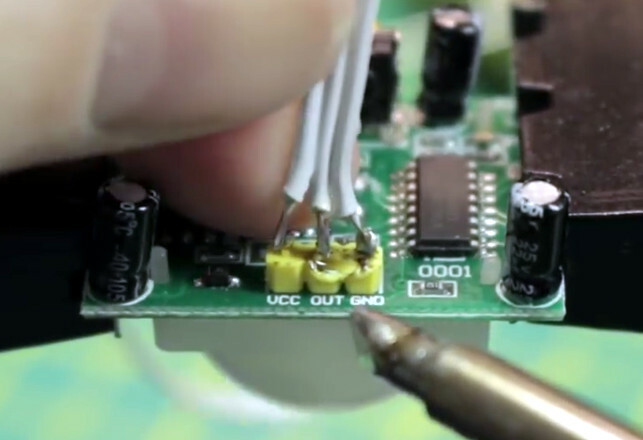 I still enjoy watching soldering tutorials once in a while. Thanks. I think RoHS solder has more to do with soldering becoming “a lost art”. The soldering is pretty brutal, but in his defense, those pins aren’t meant to be soldered to at all. It’s pretty amazing that it works at all. I would use header cables instead of soldering, or if it’s absolutely necessary desolder the headers and use the through-holes. I’m fairly sure you need a power supply for this!!! So not as invisible as it appears. So.. you going to post the revision? . Seriously I am interested. I stopped using this sensor with esp8266 while ago because of false triggers. Somehow 2.4Ghz wifi from esp8266 is triggering motion sensor. I tried shielding sensor with aluminium foil, adding capacitors… nothing helped. I googled and found that I’m not the only one. Radar sensors like HB100 are better solution for use with esp8266. Try AM312 (or the more configurable AM412 and AM612) : they are very compact and much better at working with ESP. I had the same false trigger problem before until I discovered AM312. Came here to say exactly this. Generally I like supporting people and new projects, however I don’t know how this made it to HaD — bad code, bad advice on hardware choice, and one of the easiest projects on the internet which is documented many times over (and better). You can mitigate it by making sure all the wires to the PIR pass through a ferrite, and wrapping the PIR in grounded foil. I’ve had the same issues with using a PIR too close to a Pi Zero W.
I can also vouch for this. Also other types of motion sensors can be triggered by other types of radios. But not the AM312, which besides being small comes with the benefit of lower current consumption. I’ve start using the Human Radar Sensor Modules. Sofar so good. and the end package is alot smaller smaller. Mind you the have been selling smaller motion detectors that are a bit more, but they are less the a 1/4 of the size. And I just found out how cheep the backup sensors are. Just got a package in now to play with. Looks really good. $12 gets you 4 sensors that are really small and the little computer that comes with it as well. OH Boy “the”‘s really messed my sentence. “I’ve *started using the Human Radar Sensor Modules. *So far so good. and the end package is *a lot smaller. Mind you *they have been selling smaller motion detectors that are a bit more, but they are less *than a 1/4 of the size. And I just found out how *cheap the backup sensors are. Just got a package in now to play with.